I always enjoy baking, but it’s extra special during the fall and winter months. There’s something about the way the smell of the spices so prevalent in fall recipes just permeates the air around me and everyone comments on how lovely the house smells. This Apple Pecan Cake is a great example of one of the things I love to bake this time of year. What nicer treat is there than to come home to a hot cup of tea and a slice of delicious cake? 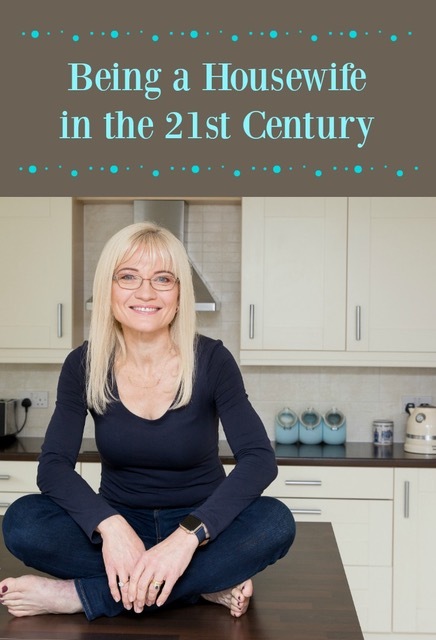 For me, it’s what the cooler months are all about – returning to the hearth and home, welcoming visitors, sharing hospitality, the sound of laughter tinkling round us as the nights draw in. No matter what the weather might be like outside, inside it’s warm, welcoming and comforting. 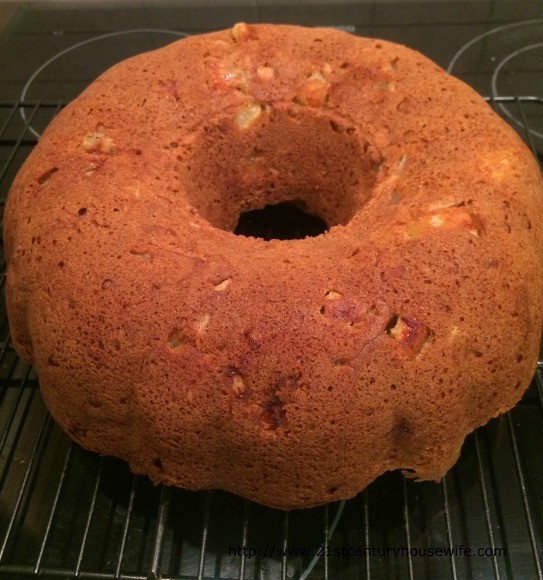 I first blogged my Apple Pecan Cake some time ago but it was one of the recipes that was too old to make the transfer to the site when I redesigned the first time a few years ago. Actually, that was no bad thing as in the process of re-blogging it the first time back in 2013, I made some adjustments. Three thoroughly tested cakes later (huge thanks to my friends, neighbours and the folks at my husband’s office), this is the even more delicious result. Three years and another blog redesign later, this recipe is still a family favourite. A little heads up about the cake batter – it’s quite thick and stiff, but don’t let that alarm you. The moisture from the apples is released as the cake is baked and it comes out of the oven gloriously tender. You do need to dollop the batter into the Bundt pan quite firmly though, spreading it with a knife to make sure it is evenly distributed. You don’t have to glaze this cake if you don’t want to. It’s perfectly delicious just as it is, but it looks a little bit naked. Having said that, it’s nothing a dusting of confectioner’s sugar won’t fix. The tasty maple glaze does make the cake extra special though. I use a British spice mix containing cinnamon, ginger, cloves, allspice, nutmeg and other warming spices in this cake. It’s called Mixed Spice and it gives baked goods a really gorgeous flavour. I’ve linked to the brand I actually have in my cupboard – a little goes quite a long way so the bottle lasts for ages. Apple Pecan Cake is one of those wonderful cakes that seems to get better the longer you keep it. It will keep for several days covered at room temperature unglazed, but even with the glaze I’ve kept it for up to four days very successfully. The flavours deepen as the days wear on and the cake becomes even more moist and delicious. Grease a large Bundt pan. Squeeze the lemon juice into a medium bowl. Peel, core and finely chop the apples, putting them into the lemon juice as they are chopped to prevent browning. Stir the lemon rind into the apples and set aside. Cream the butter, granulated sugar and brown sugar together in an electric mixer until light and fluffy. Sift the flour, baking powder, baking soda and salt together and add it to the creamed mixture in two additions, beating the flour in thoroughly after each addition. The batter will be very thick at this point. 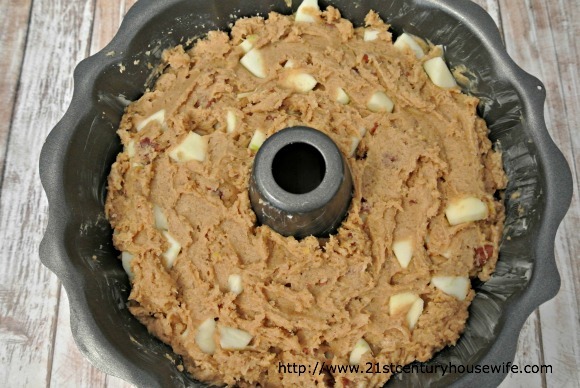 Remove the bowl from the mixer and stir the apples, lemon juice, rind and pecans into the batter until the apples and pecans are fairly evenly distributed. Again, the batter will be quite thick. Transfer the batter to the Bundt pan. You will need to encourage it in, spreading it with a knife so that the batter is evenly distributed and the top is relatively smooth. Bake for 45 to 55 minutes or until a skewer inserted in the cake comes out clean. Cool in the pan for twenty minutes and then remove the cake and cool completely on a wire rack. When the cake is completely cooked, make the glaze. Whisk the maple syrup gradually into the confectioner's sugar until a drizzle-able glazing consistency is reached. Drizzle the glaze over the cake, allowing it to dribble down the sides. Let the glaze sit for at least a half an hour to set before slicing the cake. This post may contain affiliate links. See our Full Disclosure Policy. Thank you, Andi 🙂 And I totally agree, apples are one of my favourite ingredients as well. 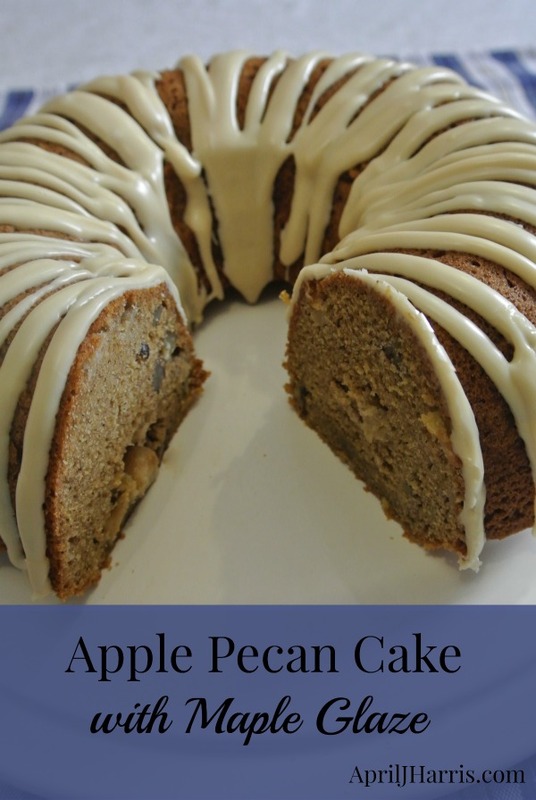 What a beautiful cake, I love the apples and pecans with that lovely maple glaze. This cake is certainly about fall and perfect for all the upcoming holidays! Hope you are having a great weekend and thank you so much for sharing with Full Plate Thursday. This cake is beautiful! Love the maple glaze, yum! Rant away. I think we all understand! I agree about baking aromas–there is something so fall about it. This cake really says fall to me, full of apples and topped with a bit of maple. I’d like to call this a coffee cake and have some for breakfast. Would that be wrong? Thank you for linking this week. We’ve been out of town w/out internet so I’m running behind! Thank you, Michelle! I think you could definitely call this a coffee cake. In fact, I ate it for breakfast more than once and it was lovely. The cake looks dangerously delicious, April! I love the maple glaze too! 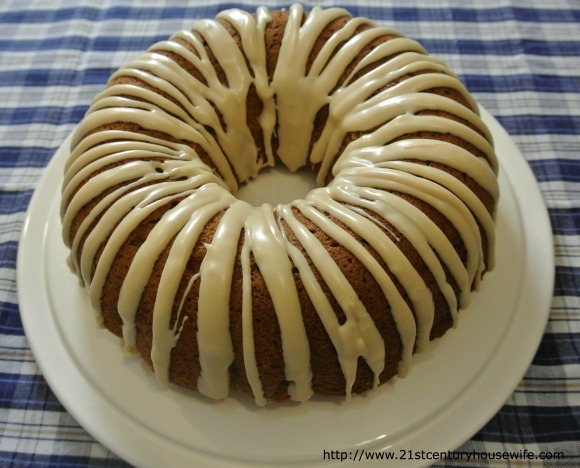 Looks delicious lovely bundt cake, tweeting and sharing in my facebook page. Thank you so much, Swathi! 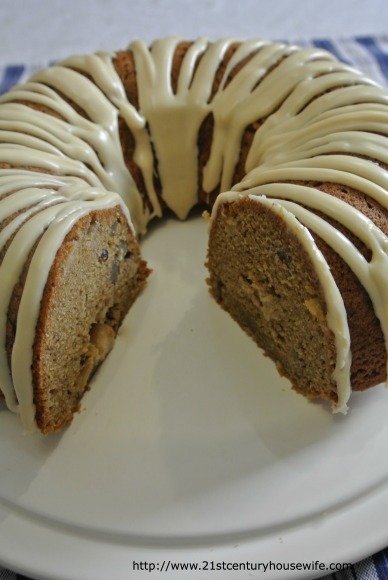 This apple pecan cake looks AMAZING !! And the glaze is awesome!! Thank you, Tina 🙂 I make this cake all year round but it really does suit the fall season best of all! I bet those apple chunks are to die for! Oh how pretty! Icing cakes is not my strong point– this looks fab! As always, this looks amazing! Perfect for fall. I think I may make it for something like Thanksgiving this year. Yum! Thanks again for all the lovely recipes! Thank you so much, Debi 🙂 It really would be lovely for Thanksgiving. Dear April. Thanks a lot for dropping by. I’m glad to take part in Heart & Soul blog Hop, the project you share with Swathi. I also love your site at first sight, because, I’m sure, I need more time to read and enjoy everything. This cake is beautiful and I imagine, that delicious.